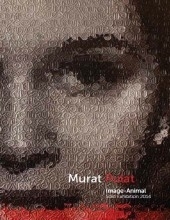 Turkish artist Murat Pulat’s first solo show in New York City will be on view at Leila Heller Gallery in Chelsea at 568 West 25th Street from January 16 – February 15, 2014. Image-Animal will feature 10 paintings depicting iconic scenes from old Hollywood movies, New Wave French films, and 1960s television shows. A three-dimensional painting installation by Pulat will be on view in the Gallery’s front windows. A fully illustrated catalogue with an essay by Emre Zeytinoğlu will accompany the exhibition. Using oil on canvas, Pulat transforms the silver screen to a work of fine art. Screen sirens such as Marilyn Monroe, Audrey Hepburn, and Mia Farrow grace Pulat’s canvases in the form of richly toned, textured paintings. Glass Studio(2013) depicts one of the most iconic scenes in Hollywood film: Janet Leigh behind the wheel of a Ford Sedan from Alfred Hitchcock’s Psycho. Using various tones of grey, Pulat references the black and white nature of the original film. However, the artist breaks away from realism of a film-still by highlighting Leigh’s face and the car’s rear window with saturated shades of aquamarine and blue. This notion of referencing the antiquated features of the original film while introducing his own interpretation through color is common in Pulat’s practice as he reminds the viewer of something familiar yet new at once. Materiality is also an important component in Pulat’s paintings. By using traditional materials of oil on canvas, in the form of thick coats of paint to the canvas’s surface, Pulat creates dotted textures. The texture the artist creates on his oeuvre defines the paintings from the realism of a film-still; however, these textural grains reference the pixels of a film, reminding the viewer of the origin of the paintings’ subject matter. Born in Aksehir, Turkey in 1978, Murat Pulat lives and works in Istanbul. He studied Fine Art at the Marmara University. His work has been exhibited internationally including in Istanbul, London, Dubai, Los Angeles, and New York.